Christmas is coming- but shouldn’t we acknowledge Thanksgiving first? | The Sweet Life By B.
Christmas is coming people and we must prepare! I know that Thanksgiving is just next week and it is unfair of me to not hold this selfless holiday in the highest regard and give it the proper respect that it deserves. I know that it is morally wrong to gloss over Thanksgiving. Maybe it is because I do not have any real responsblities for Thanksgiving except show up. Do you have any idea how abstract and great this is for me? I am thankful for Thanksgiving because I do not have to do one thing at all. It’s crazy. I love it! We always visit Brian’s wonderful family for the beginning part of the holiday and the other part of the holiday is spent with my family. By Saturday afternoon, we are on our way home to get our Christmas tree and begin Christmas. What has happened to Thanksgiving? You will be surprised by this, but oddly enough , Thanksgiving was/is my favorite holiday by far. Why then if it is my favorite, do I not want to hold onto it, cherish it, savor it? 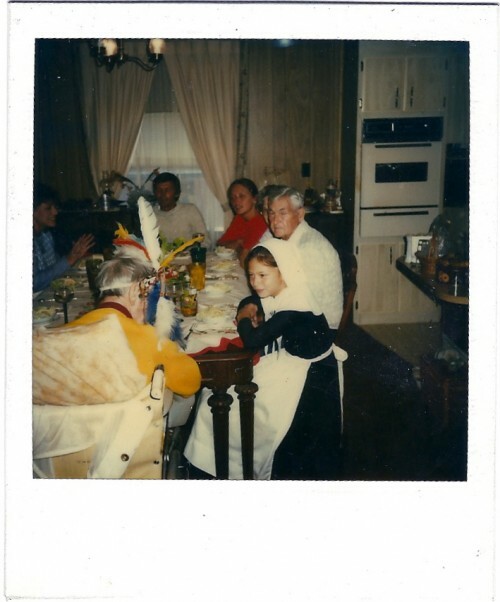 Well… one day Thanksgiving changed for me. I have the strongest, dearest, memories of this special holiday when I was younger. The memories were always the same, just the year would change. Every Thanksgiving was the same. I was always the first one up, next to my Mom of course. I would then run to the living room, claim the big velvet wing chair ant wait…. and wait…. and wait… in front of the television, waiting patiently for the Macy’s Thanksgiving Parade to begin. I would start yelling to my Dad. Daddy hurry! Hurry! The parade is starting! You are going to miss it!! He NEVER missed it! My Dad would always be in his assumed position as well. At every commercial break we would peel and cut vegetables for my Mom, stack Andes Candies on crystal plates, put out assortments of nuts, set a beautiful Cornucopia like platter of fruits. Being with my Dad for four straight hours, everyone home- no one working, the food, the parade- it was the best! I lived for this! Thanksgiving was so much more important to me than Easter, Christmas, even Halloween. This was a big deal considering I was just a kid. This tradition carried on until I was married. At that point, there were choices to make, compromises, separations. I’ll never forget the first year that I could not be with my Dad on Thanksgiving morning. It felt like I was being kicked in the gut and being taken away unfairly from something that meant everything to me. It was awful . I cried and cried, and cursed and cursed. AWFUL! Poor Brian. He was so thrilled to have me celebrate Thanksgiving with his family. He would say baby, we are going to go to your parents later in the evening. This statement only provoked me to cry and curse even more. I would say, you don’t know me at all! You have no idea. If I can’t be with my Dad on Thanksgiving morning watching the parade then Thanksgiving means nothing to me… it is just not the same! Poor Brian. I was such a baby. The problem was, I had this ongoing, reoccurring date with my Dad. If I couldn’t be with him I didn’t want to be with anyone. Thanksgiving would be just another day. I still do love Thanksgiving but it’s not the same anymore. I don’t think that I have spent many Thanksgiving mornings with my Dad since the first one I had to give up. It still is hard but the good part is that I have grown up and I understand my choices better. I am not going to lie, my belly aches every Thanksgiving morning thinking of what I am missing. I don’t cry or curse so that is definite progress. I do want to be with Brian and his family it’s just I can’t be with my Dad anymore. I can’t have both. At least on Thanksgiving morning. My Dad and I have a deal now. He records the parade and we just watch it together, whenever I get home. There aren’t any more food preparations together- which I miss terribly- but it is what it is and I’ll take it because I love both of these men more than the world and I want to be with both of them. I love you Daddy and I love you Brian! Thank you both for being so patient with me! This year I am just so thankful to be able to be with all of my family, both Brian’s and my own. Wishing everyone a very Happy Thanksgiving! 5 Responses to Christmas is coming- but shouldn’t we acknowledge Thanksgiving first? Brandi, I will never forget that first Thanksgiving you spent with us and how much you missed your family and watching the Macy’s parade with your dad. In fact, every Thanksgiving when I watch the Macy’s parade I think of you and about how much you must be missing that special time with your dad. I feel you have touched on a subject that I am sure most of your bloggers can relate too. It is human nature to want to be with our family for the holidays and to keep wonderful family traditions going. But as we grow up situations change and like you said we must all compromise. As you will discover when the littles marry and have families, it is just as hard for mom’s and dad’s to realize they might not be able to spend every holiday with their son/daughter. As Brian’s mom, I can tell you I have shed a tear or two when we have been apart on Christmas Day. Of course it was a selfish tear because he was where he should be, with his wonderful wife and children whom I love very much.